The Laurier community looks back on the life of Tamara Giesbrecht Warren, the first woman to hold a vice-president position at the university, who passed away May 12. An employee of the university for 18 years, Tamara was also a member of the Order of Canada and received an honorary doctorate from Laurier. Born in Russia in 1922, Tamara’s family fled the fascist regime of Josef Stalin, immigrating to Canada and settling near Kitchener when Tamara was a young child. Tamara’s father passed away within two years of arriving in Canada, leaving her to take care of her three siblings while her mother worked. Tamara joined the workforce herself at just 16 years old, taking a job at a shirt factory. After being handed a box of paid and unpaid bills to straighten out, Tamara’s first budget resulted in a surplus, something that would continue through every year of her career. She became known as the university’s “financial wizard,” playing a key role in helping Waterloo Lutheran establish itself as an independent institution. After seven years working as the university’s business manager and controller, Tamara’s post was made a vice-president position in 1967, making her the first female vice-president in the institution’s history. 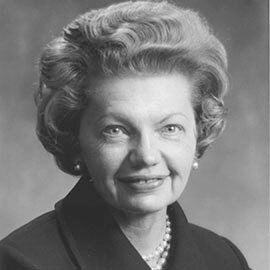 She was also the first woman in Canada to sit on a university board of governors. As vice-president: controller, Tamara would again play a crucial role in a key development in the university’s history, when in 1973 Waterloo Lutheran University became a public institution, ultimately creating Wilfrid Laurier University as it is today. After a highly respected career at Laurier, Tamara retired in 1978. She maintained a connection to the university, providing financial consulting on special projects as recently as 2002 and serving as an active member of the Wilfrid Laurier University Retirees' Association.